Town View Leather Moccasins owned and operated by Galen and Gayanne Wintle, Dexter, ME 04930. Double Sole Moccasins for men and women are what we do best! Double Sole Leather Moccasins by Town View Leather is a family business operated by Galen and Gayanne Wintle, located in the heart of Central Maine. 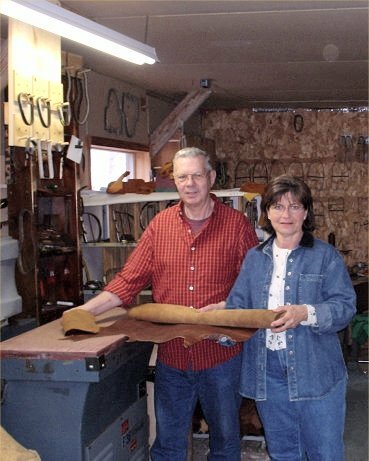 We have been making moccasins since the late "80's in our home based leather shop. Before we started our own business, Galen worked at Dexter Shoe for 22 years. Learning the art of handsewing from the "oldtimers", he came to love the work and look of genuine handsewn footwear. Galen and Gayanne created the "Ole' Maine Comfort Classic Moccasin" to relax in after a hard days work or just lounging around the house. Flexible, durable leather in every pair of moccasins surrounds the foot for natural comfort and instant break in. Loving care goes into every pair of "individually handsewn moccasins", to make your personal moccasin the most comfortable pair of double sole leather moccasins that you will ever wear. Our double sole or double bottom moccasins are really "triple" soles because we put an extra layer of leather between the moccasin and the stitched on double sole for added comfort. We are now using a thicker, more durable Bull Hide leather for the double sole. Combining that with great classic looks and craftsmanship it creates a long time friend. There is nothing quite as special as handsewn moccasins. When you wear a pair of double sole "Ole' Maine Comfort Classic Moccasins"....Deerskin Lined or Unlined you will feel the comfort right away. We try our best to purchase, soft, but durable leathers for the "broken in" feel when you first put your new pair of moccasins on for the first time. We offer "Factory to you Pricing" because we make them ourselves right here in the USA.